Deuteronomy is the fifth book of the Hebrew Bible. It is part of Judaism's Torah and Christianity's Old Testament. Its Hebrew name is Devarim—דברים ("words")—which comes from the opening phrase, "These are the words which Moses said." Its English title, "Deuteronomy," comes from the book's name in the Septuagint Greek translation of the Hebrew Bible and the later Latin Vulgate (Deuteronomium). The term implies a reiteration, or "second-giving," of the Law of Moses. The language of Deuteronomy is often inspiring and poetic, portrayed from a retrospective view as the Israelites complete their period of wandering the the wilderness and prepare to enter the Promised Land of Canaan. It is the source of the famous Jewish prayer known as the Shema (Deut. 6:4) and the well-known injunction, "Love the Lord your God with all your heart and with all your soul and with all your strength, (Deut. 6:5) taught by Jesus in the New Testament. It is also the source of important legal traditions later introduced into both European and Byzantine law codes. Deuteronomy is much discussed by modern biblical scholars, who consider it to have been composed in the seventh century B.C.E. as part of a program to centralize worship exclusively in the Temple of Jerusalem. The death of Moses (Deut. 34:5). 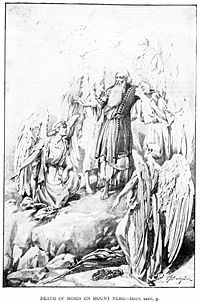 Deuteronomy consists chiefly of three discourses delivered by Moses to the Israelites a short time before his death, on the plains of Moab, near the end of the final year of their wandering through the wilderness. Moses summarizes the trials the Israelites have endured, reminds them of God's justice and mercy, outlines various commandments they must obey, and urges them to go forward to conquer the land of Canaan. The Canaanite nations are to be driven out or destroyed, and the Israelites are strictly commanded to refrain from intermarrying with them or worshiping their gods. A central place of worship is to be established, and no sacrifices are authorized to be performed at any other location. The Ten Commandments are reiterated, and a detailed set of specific laws are instituted. Finally Moses offers the Israelites a set of blessings if they follow God's will, together with frightful curses if they rebel. 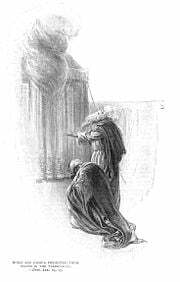 Joshua is appointed as Moses' successor, and the book concludes with an account of Moses death. The disobedience of Israel is contrasted by the justice of God. God is a judge to Israel, punishing them in the wilderness, and destroying utterly the generation who disobeyed God's commandments. God's wrath is also shown to the surrounding nations, such as King Sihon of Heshbon, whose people were utterly destroyed during this time. In light of God's justice, Moses urges obedience to divine ordinances and warns against the danger of forsaking the God of their ancestors. At the same time, Moses emphasizes God's forgiveness and grace towards the young generation of Israelites. God will be with the Israelites and will drive out their enemies, giving them land of Canaan, which is a good land, "flowing with milk and honey." A number of laws are set forth, which Moses also describes as a gift of divine grace. Moses repeatedly reminds the Israelites that they must carefully obey the commandments. They must not intermarry with the Canaanites, and must demolish their places of worship. They must make no treaty with the Canaanite tribes, and are commanded to "totally destroy them." (7:2) On the other hand, if the Israelites turn to other gods, it is they who will be completely destroyed. (8:20) Moses reminds them of the incident of the Golden Calf and strictly warns them of the consequences of idolatry. The Deuteronomic code is a series of commands, forming extensive laws, admonitions, and injunctions to the Israelites regarding how they ought to conduct themselves in Canaan, the land promised by God as their permanent home. Great emphasis is placed on Israel's separateness from the other peoples of the land, and they must especially refrain from worshiping the Canaanite deities. The following list divides the code into three categories: religious laws, rules governing political affairs, and laws covering civil and criminal matters. The list is not exhaustive, and it should be noted that the categorization is artificial. In fact, all of the Deuteronomic laws are characterized as commandments from God. A strict ban is imposed on religious prostitution. Earnings from any type of prostitution may not be used in connection with Temple offerings. Only unblemished animals are to be offered as sacrifices to God. Sacrificing one's children and/or dedicating them to foreign deities is strictly forbidden, as are divination, sorcery, witchcraft, spellcasting, and mediumship. Deuteronomy establishes the office a judges and bans bribery. The death penalty by stoning is prescribed for sons who persistently disobey their parents. The second discourse concludes with an speech reminding the Israelites that in their new land, they must be careful to remember to bring their tithes and offerings gratefully to the religious capital every year, and also to care for the Levites, widows, and orphans in their localities. If they do this, God will surely bless them. The concluding third discourse (27-30) is an exhortation, relating primarily to the solemn sanctions of the law: blessings to the obedient and curses to the rebellious. When the Israelites enter Canaan, the tribes are to gather in two groups of six tribes each on two facing mountains. The blessings are to be pronounced from Mount Gerizim and the curses from Mount Ebal. (27) In this discourse, the Israelites are solemnly adjured to adhere faithfully to the covenant between them and God, and so secure for themselves, and for their posterity, the promised blessings. Moses presents Joshua before God at the Tabernacle. After this, Joshua is appointed by Moses as his heir and successor to lead the people into Canaan. The Song of Moses, which the text states was created by Moses upon the request of God (32). Moses' final blessing, which is pronounced upon the individual tribes of Israel (33). The story of the death of Moses (Deuteronomy 32:48-52), and subsequent burial (34). 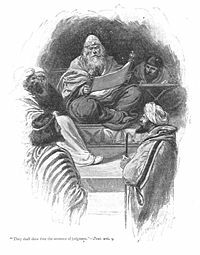 The rabbis of the Talmud were the first to discuss the assumed premise that Moses wrote the entire five books of the Torah, especially Deuteronomy. They wondered how Moses could possibly have written the text recording his own death and burial, as well as the words that "... since then, no prophet has risen in Israel like Moses." While some of the rabbis contended that Moses wrote these verses prophetically, the dominant talmudic opinion is that Joshua wrote the final verses of the Torah. Later Jewish biblical exegetes, notably Abraham ibn Ezra (c.1093-1167 C.E. ), noted the distinctly different meditative style and language of Deuteronomy (see documentary hypothesis). Ibn Ezra stated that a number of verses must have been written by a later author, again probably Joshua. Similarly, in his introduction to Deuteronomy, Don Isaac Abravanel (1437-1508) suggested that Deuteronomy had a different author to the rest of the Torah. A clue to the origin of the Book of Deuteronomy is found in of 2 Kings 22-23 in the narrative concerning the religious reform conducted during by King Josiah and his priests. During the process of restoring the Temple of Jerusalem at the king's command, the high priest Hilkiah reportedly found the lost "Book of the Law." The biblical story continues that Josiah and Hilkiah went to the prophetess Huldah to confirm the book's authenticity. She did so, adding that because of Judah's idolatry, God was about to fulfill the curses the book describes. As a result, a public reading ceremony only otherwise mentioned in Deuteronomy was conducted. Josiah proceeded to purge the Temple of pagan influences, including the presences of an Ashera pole and sacred prostitutes. (2 Kings 23:6-7) He also destroyed both pagan and Yahwist altars outside of Jerusalem, bringing the Yahwist priests to Jerusalem but slaying any priest who sacrificed to other gods. He did these things "to fulfill the requirements of the law written in the book that Hilkiah the priest had discovered in the temple of the Lord." (2 Kings 23:24) The account in 2 Chronicles 35 mentions that Josiah also instituted a national celebration of Passover in Jerusalem at this time, in which the Levites played a central role. The idea that the lost scroll found by Hilkiah in the seventh century B.C.E. (2:Kings 22) was none other than Deuteronomy dates back to talmudic times. 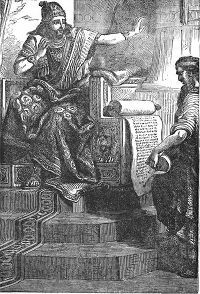 Later textual scholars went further, however, suggesting that Deuteronomy had not simply been found during King Josiah's reign (c. 620 B.C.E. ), but that it had been written at that time as well. Deuteronomy is the only book of the Pentateuch to impose the centralization of worship at a single location where sacrifices could be legitimately offered. Moreover, its stipulation that Levites who moved from outlying areas to the capital be recognized as authorized priests fits perfectly with Josiah's reform and seems totally out of place in the time of Moses. In effect, these policies of centralization were the very essence of Josiah's reform, which he completed in direct response to the dictates of the lost "Book of the Law." According to the documentary hypothesis, the Book of Deuteronomy was thus not written by Moses, but by an author or authors of the seventh century B.C.E. as a means of bolstering their program of centralizing worship in Jerusalem and eliminating all rival centers of worship, both Israelite and pagan. Literary critics point out that style and method of this book and its peculiarities of expression show that it came from a school of thought separate from the rest of the Torah. In fact, Deuteronomy often refers to itself as a separate code of law (1:5, 8:26, 27:3, 31:26), distinct from the four preceding books of the Pentateuch. In addition to the book's emphasis on "Jerusalem-only" sacrifice and the relocation of Levite priests from outlying areas to the capital, scholars have also noted differences in language and style, the laws themselves, and some anachronisms in the text. Similarly, it is notable that neither Amos, nor Hosea, nor the undisputed portions of Isaiah show even the remotest familiarity with Deuteronomy. These facts can easily be explained if Deuteronomy was written after these three prophets and before Jeremiah, placing its creation squarely in the seventh century B.C.E. In fact some see the text as particularly reminiscent of Jeremiah. Several scholars have posited him, or his scribe Baruch, as the book's real author. Arguing against this, however, is the fact the Jeremiah was by no means and ardent supporter of the Temple. Indeed, he was at times its harshest critic. Another theory points to the strong denigration of Aaron in Deuteronomy (he dies shortly after the incident of the Golden Calf, while in the Book of Numbers he dies in the fortieth year of the Exodus) as evidence of the influence of the Shiloh priesthood in the Deuteronomic narrative. A third, more obvious choice, is Hilkiah himself, or one of his scribes. In any case, modern biblical scholarship is agreed that Deuteronomy was created in, or very close to, the reign of Josiah. Further study of the other books of the Torah has led to the documentary hypothesis becoming overwhelmingly accepted among academic biblical scholars. The Deuteronomist's work, or that of his school, is believed to have also included the editing and compiling of earlier histories into the books of Joshua, Judges, Kings, and Samuel. The earliest manuscripts do not indicate alternative authors. The earliest available Jewish and Biblical oral and written tradition confirms Mosaic authorship. The author of Deuteronomy, as with many other books of the Torah and the Christian Bible, remains contentious points of debate. For many, however, Deuteronomy is key to a proper Evangelical understanding of the Mosaic law and a contextual understanding of the words of Christ. ↑ The second half of this summary is a quote from Leviticus 19:18: "Love your neighbor as yourself." ↑ Not to be confused with the judges who led Israel in the Book of Judges. ↑ In later history, Mount Gerizim became the central shrine of the Samaritans, while Jerusalem became the religious capital of the Jews. ↑ Richard E. Friedman, Who Wrote the Bible? (San Francisco: Harper, 1997, ISBN 978-0060630355). ↑ The Ark of the Covenant was moved from Shiloh to Jerusalem by King David, and any remaining priests of Shiloh may have relocated to Jerusalem after the Assyrian conquest of the northern kingdom in the eighth century B.C.E. According to some theorists, Shiloh priests were not of Aaronic descent and were thus more likely to report unflattering things about him. They also worked in close proximity to the rival Yahwist shrine of Bethel, which featured a golden statue of a young bull, while Shiloh had been famous for its golden cherubim atop the Ark. See Frank Moore Cross, Canaanite Myth and Hebrew Epic (Harvard University Press, 19973, ISBN 978-0674091764). All links retrieved December 14, 2018. Rabbi Aryeh Kaplan's translation ort.org. Translation with Rashi's commentary Chabad.org. Book of Deuteronomy Jewish Encyclopedia. History of "Deuteronomy, Book of"
This page was last modified on 14 December 2018, at 20:30.